When talking about "PDF to Excel", you might think of convert the whole document in *.pdf format into *.xls format file. This is the old fashion way and sometimes it turns out to be unsatisfactory, managing to complete the format transition but distorting or leaving out the content inside. Owing to above reason, we are not simply focusing on the file format converting, but also pay attention to the completeness of the file content and data. Batch PDF to Excel Converter (A-PDF To Excel) could be the most accurate solution for retain original content while batch converting PDFs to Microsoft Excel spreadsheets or CSV files. Rather than simply convert format, this powerful PDF software intelligently extracts content data tables from a batch of PDF documents and converts them into MS Excel files that can be easily manipulated with MS Excel tool. Accurately extract & convert content data tables from a PDF to MS Excel or CSV file. Convert PDF to Microsoft Office Excel in batches. Retain Row & Column structure of PDF table within Excel file. User-friendly interface for you to customize the table and conversion rule. There are a lot of software that can help you convert PDF to Excel, but most of them are too troublesome and require you to repeat the work over and over again. But with Batch PDF to Excel Converter, you don't need to add and convert a million times and wait and begin a next conversion until one conversion is done. This PDF to Excel spreadsheet software enables you to convert PDF into Office Excel in batches with ease, which can make your work more efficiently. Batch PDF to Excel Converter is easy to use. You just need to add a PDF file, draw vertical lines to form data table, apply the table settings to other pages of the PDF file, and extract to Excel. You can also export the settings as a rule and then import it for future projects. And once you save the rule, you can apply it directly for the batch converting. Batch PDF to Excel Converter allows you to save the extracted PDF content as Excel or CSV file, and you can save them in merged or separate documents. All PDF files to single Excel file in one sheet. 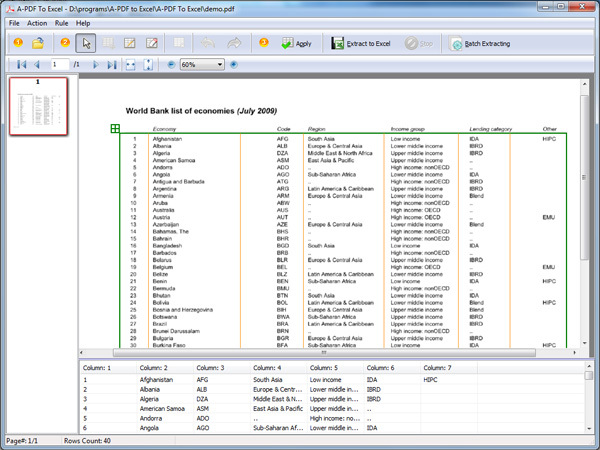 Each PDF file to multi-separate Excel files. Each PDF file to single Excel file in separate sheet. All PDF files to one CSV file. Each PDF file to multi-separate CSV files.